Simple baking tips and tricks to help your gluten-free baking. Keep in mind that gluten-free and vegan dough tends to be slightly sticky. 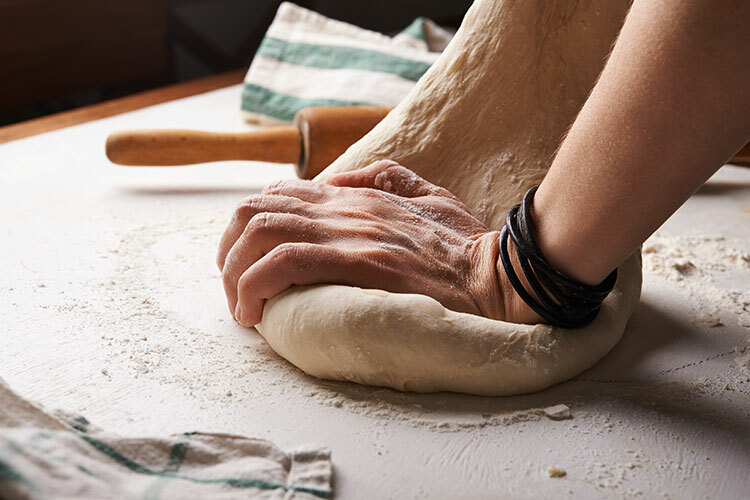 Always handle dough with either wet fingers, lightly floured hands or use wax or parchment paper to ensure that it doesn’t stick to your fingers. Always roll your dough between two pieces of parchment paper. This will greatly help your sanity and keep the dough from sticking to the counter or rolling pin. If you are still having troubles, place the dough in the fridge to chill for at least 30 minutes. If your dough becomes crumbly throughout the course of being chilled or even when sitting out on the counter, add 1 teaspoon of water at a time to rehydrate. Before adding more, make sure that the water is thoroughly blending in. Also, if you play around with and knead the dough, the warmth of yours hands can be enough to make it more cohesive. Most gluten-free goods need to be baked longer because the batter and dough tend to be moister than regular batters. If you are taking a loved recipe and converting it on your own, make sure you give it a little more baking time. Vegetable gums such as xanthan gum, can be used in baking recipes to play the role of a ‘gluten substitute’ by helping to improve elasticity and crumb structure in baked goods. Gluten-free flour blends should be sifted three times to ensure the flours are evenly mixed and aerated. Raising agents (for example, gluten-free baking powder and bicarbonate of soda) and vegetable gums should be sifted together with the flours.